A young carer is a person under 18 who provides or intends to provide care for another person. They often take on practical and/or emotional caring responsibilities that would normally be expected of an adult. ‘A young carer becomes vulnerable when their caring roles risks impacting upon their emotional or physical wellbeing and their prospects in education and life’ (Care Act Statutory Guidance, 2014). It is likely that there will be many young carers at every school. The 2011 Census identified 177,918 young carers in England and Wales. 1 in 8 were aged under 8. This is widely believed to be the tip of the iceberg. 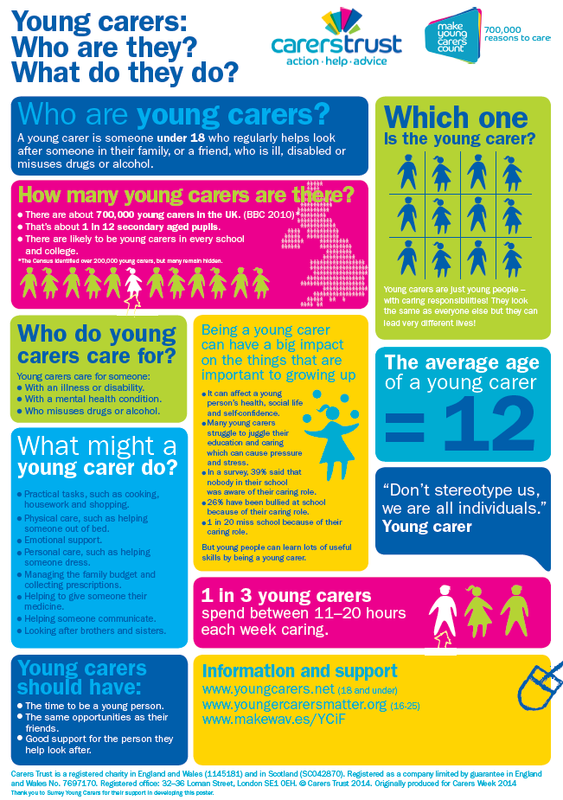 Further research (BBC, 2010) suggests there could be 700,000 young carers in the UK, many unaware of the impacts of the caring role they are undertaking. That means about one in 12 secondary aged pupils have caring responsibilities. What impact can caring responsibilities have on a pupil’s attainment, attendance and wellbeing? Young carers experience particular challenges and demands that impact on their capacity to enjoy and achieve at school. 27% of young carers (aged 11–15) miss school or experience educational difficulties (40% where children care for a relative with drug or alcohol problems) (Dearden, C, Becker, S, 2004). A quarter of young carers said they were bullied at school because of their caring role (Sempik, J & Becker, S, 2013). They are more likely than the national average not to be in education, employment or training (NEET) between 16 and 19 (The Children’s Society, 2013). Although young carers need extra support, they are no more likely to find it from statutory agencies than other children (The Children’s Society, 2013). They have significantly lower educational attainment at GCSE level – the difference between nine Cs and nine Ds (The Children’s Society, 2013). Department of Health (2014), Care and Support Statutory Guidance (Department of Health). BBC (2010) “Hidden Army” of young carers could be four times as high as official figures. Available at http://www.bbc.co.uk/news/education11757907. Dearden, C and Becker, S (2004), Young Carers in the UK: The 2004 Report (Carers UK and The Children’s Society). The Children’s Society (2013), Hidden from View (The Children’s Society). Sempik, J and Becker, S (2013) Young Adult Carers at School: Experiences and Perceptions of Caring and Education (London, Carers Trust).